The overall health of Palma Sola Bay continued to be very good in 2017. Levels of chlorophyll a and nitrogen improved, with both being below their desired target values and earning them "Excellent" ratings. However, phosphorus concentration again rose, with high levels above the threshold early in the year, eventually dropping below the target value in late 2017. 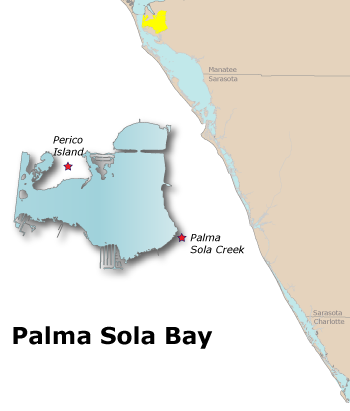 The average for the year was only slightly higher than in 2016, but enough to cause Palma Sola Bay's rating for phosphorus to be downgraded from "Excellent" to "Good". Water Quality: Palma Sola Bay retained its 2016 “Pass” rating as all three water quality indicators (chlorophyll a, nitrogen, and phosphorus) were below established thresholds. The mean concentration for chlorophyll a dropped slightly, to 0.0067 mg/l, well below the target value. Mean nitrogen concentration dropped as well, to 0.6218 mg/l which is below the target value and caused the rating for nitrogen to be upgraded from "Good" to "Excellent". Phosphorus concentrations rose to 0.1422 mg/l, above the target value and downgrading the phosphorus rating to "Good". The mean for chlorophyll a was calculated as an arithmetic mean and the means for nitrogen and phosphorus were calculated as geometric means (per the Numeric Nutrient Criteria outlined in the Florida Administrative Code, section 62-302.532).